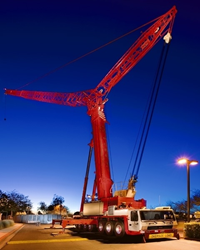 Crane Inspection & Certification Bureau’s fast growing Houston Operations has added programs and staff to keep pace with industry’s need for trained and certified Crane Operators, Riggers and Safety Personnel. Everything is bigger in Texas, including the demand for quality training and certification programs for operators, riggers and safety personnel. To meet this demand, Crane Inspection & Certification Bureau (CICB) has expanded its programs to include monthly training programs for Crane Operators plus NCCCO Crane Operator Certification, Riggers, Signal Persons, and the popular Crane Inspector and Train the Trainer Programs. CICB has also expanded its Houston staff to include an additional, professionally trained, bi-lingual subject matter expert to provide crane operator, rigger, inspector and material handling equipment safety training to the Spanish-speaking workforce. “Accident statistics for the Spanish-speaking workers in the construction industry are often higher than the work population at large” as reported by the Crane and Rigging Hotline Magazine, November 2013 issue. “CICB is reaching an at-risk demographic with important safety instruction,” says Craig Epperson, CEO. Along with being the preferred training supplier for the petrochemical, aerospace and airline industries, CICB has now become the area leader in providing training to the Spanish-speaking workforce. Additionally, the Administrative Staff at the Houston facility has increased, to assure continued superior customer service and support. CICB’s Houston Training Center has several large modern classrooms along with designated practical areas to provide the trainees with both applied and visual learning. The Center is fully equipped with all the gear needed for hands-on training for qualification or certification including a myriad of cranes from articulating boom trucks to lattice boom crawlers along with overhead cranes and an abundance of rigging gear. “There are no generic safety professionals at CICB. Our instructors are qualified, certified and nationally accredited for the roles that they are teaching and evaluating.” says Billy Cook, Director of Sales. “If training can assist your company with reducing risks, improving safety, and improving the bottom line, wouldn’t it make sense to budget for training for your employees and your contractors?” CICB trainers have been nationally recognized as Top Trainers in the field for 2009, 2011, 2012 and 2013. In addition to being the preferred supplier for safety training and certification for the petrochemical, airline, and aerospace industries, CICB’s training is also well known within the nuclear, civil and industrial construction, maritime, government, Armed Forces, and manufacturing sectors. CICB, headquartered in Orlando FL since 1969 with a second training facility in Houston TX, offers scheduled training programs at our facilities and at various locations across the U.S. or customized on-site training at your facility. CICB’s professionally trained instructors and subject matter experts are not only NCCCO Certified as Mobile, Overhead & Articulating Cranes Operators, but are also CCO Certified Riggers, Signalpersons, and Crane Inspectors. All of CICB’s trainers are NCCCO accredited Practical Examiners.